What does international business mean to you? The #everybodysbusiness public awareness campaign is asking that question as it rolls out its collaborative message to the wider community about the value of Bermuda’s IB sector. Included are portraits and video narratives of Bermuda residents whose livelihoods depend on or thrive because of international businesses—including Kamilah Cannonier, of Sweet Saak Bakery, farmer Tom Wadson, fisherman Mo Hamza, realtor Laura Bolton, cricket coach Dante Wellman, young cricketer Jayden Symons, chef Jonny Roberts of Bolero Brasserie, XL Catlin underwriter DeVrae Tankard, Craig [DJ Bubbles] Darrell, construction foreman Anthony Cupidore, and students and twin sisters Myrtia and Michaela Eberly. “As the final video was released today, showcasing how a single job interview can connect varied parts of Bermuda’s corporate ecosystem, the campaign sent out an invitation to Bermuda residents: to share stories and photos illustrating their own connections to international business, personally or professionally, directly or indirectly,” the BDA said. “Over the last few weeks, we have had an excellent start to the #everybodysbusiness campaign with more than 1,000 views of our videos on social, and many more thousands viewed by the Bermuda community,” said ABIC’s Cyril Whitter. 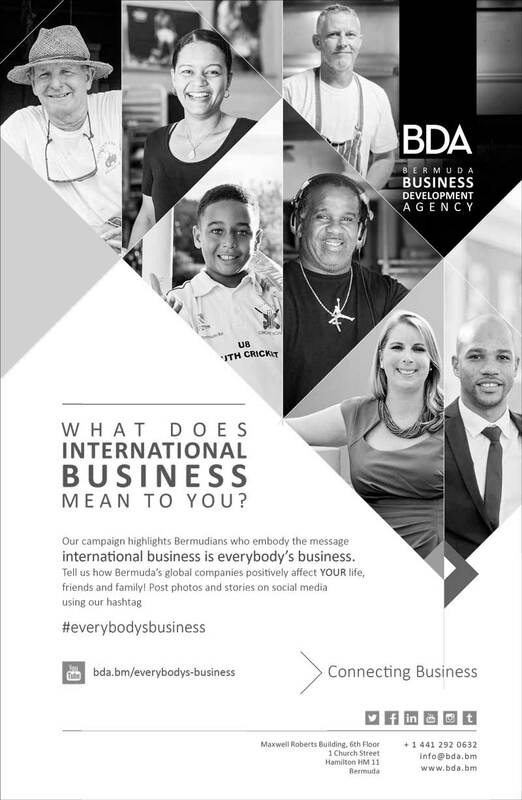 The BDA added, “The #everybodysbusiness campaign underscores the fact that IB and supporting industries make up a third of the national workforce, and that 55 percent of all IB employees on the Island are Bermudian [65 percent including their spouses], with an average per-employee contribution of $100,000 to the local economy every year. Notably, Bermudians make up close to 40 percent of IB’s executive management.